Posted on June 1, 2010, 10:14 am, by Thomas Hawk, under Photography. New York Magazine: Are you still shooting? Do you have an ideal person in mind to shoot now? Dennis Hopper:I haven’t changed much. I carry a camera around when I remember to. I take a picture every now and then. 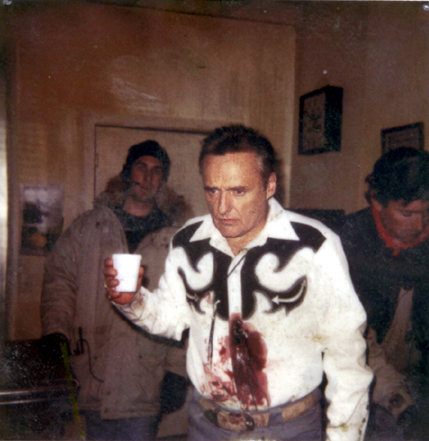 Dennis Hopper died over the weekend. There are plenty of obits running around the web and several of them seem to mention his photography. I’d never known Hopper as a “photographer” per se, but apparently he did quite a bit of it. My mom gave me a book of photographs by Sammy Davis, Jr. this past Christmas. I love that book. So I did a bit of research on Hopper’s photography. I couldn’t find a web page dedicated to Hopper’s photographs. It seems like some crappy domain squatter is sitting on dennishopper.com, so there is nothing there. It doesn’t look like he even had his own website really. I found a twitter account for him, but who knows if that’s really him. That Twitter account links to this page as his, but it’s a pretty weak page and doesn’t include anything about his photography. The Twitter account is more interesting. It mostly feels like it’s him scrounging for money. But again, who knows if this is even Hopper’s real Twitter account. Remember that time when Kayne went all agro when someone was impersonating him on the Twitter? By the way, Kanye’s new single “leaked” on the web over the weekend is also pretty dope. And he didn’t even pay me to write that. But this blog post is about Dennis Hopper’s photography and not Kanye West, so let’s carry on. I remember seeing Hopper in a television commercial on CNBC about a year ago for Ameriprise Financial and remember thinking, really? Dennis? You really need money *that* badly? It sort of felt like that time I first saw Johnny Cash doing a Taco Bell commercial way back in the day. Sometimes you forget that your idols have to pay bills after all, but seeing a minituriazed Johnny Cash, selling himself as “a little cash” and pitching low priced tacos seems beneath the man who could also belt out that he shot a man in Reno just to watch him die. Or like that advert that I just heard the other day with Bob Dylan crooning for some insurance company. What have we gotten ourselves into? The times they are a changin’ I guess. So the next place I went looking for Hopper’s photography was on Amazon.com. Surely he probably put out a book of photographs at some point I’d figure. And lucky for me I found one. Unlucky for me it’s 925 bucks! It does look like a pretty interesting book of photos though. For those of you too cheapskatey to pay $925 for a photography book, here’s a tip, you can get the same book directly from some art gallery for only $700. What a steal. There’s more information on the Hopper book here, including a gallery of some of the pages that you can actually browse. Apparently the pressing was limited to 1,500 and they are signed. I suppose they won’t be making any more signed copies of this book, so who knows, maybe $700 is a steal after all. I did find this site of a bunch of his photos from artnet. I liked this one alot. I think it’s a photograph of the same famous gas station that photographer Stephen Shore is known for, but maybe not. It is interesting that Hopper said he didn’t crop his images. Stephen Shore says the same thing. I also found this very informative article from Leah Ollman about Hopper’s photography. It’s much more informative than my little post and I suppose explains why she’s the journalist for the L.A. Times making the big bucks and I’m just some hack blogger yapping on complaining about how much Dennis Hopper’s photo book costs in a blog post or droning on about celebrity endorsements and Kanye West. “I think of them [my photographs] as ‘found’ paintings because I don’t crop them, I don’t manipulate them or anything. So they’re like ‘found’ objects to me,” Ollman quotes Hopper as saying in 2001. So I’m supposin’ that maybe Hopper wasn’t a big photoshoppery sort of guy, unlike yours truly. He did shoot digital though later on in life though according to another interview. According to Ollman, in July there is going to be a show of Hopper’s photographs at the MOCA down in Los Angeles. Perfect timing I suppose. aphotostudent.com has a lot more of Hopper’s photographs and also has a reprint of a New York Magazine interview he did on his photography that feels pretty recent. He talks about Obama as President in the interview, so it can’t be that old. (edit: original interview from NY Mag dated 9-16-09 here). Here’s another interview that Hopper did on his photography from 1999 with Tony Shafrazi.